Shraddha Kapoor may terrorise audiences in her upcoming horror-comedy film Stree, but admits she's no braveheart. "I sleep with a small light on at night," she says. "If it's pitch dark, I get scared." "I want to be remembered," Shraddha tells Rediff.com's Patcy N.
What was your reaction when you first heard the script? It was so funny that I wanted to be a part of it. I said yes in my mind, but because I did not want to seem over-excited, I informed them by the evening. Weren't you sceptical that you would play a ghost? We don't know that I am the ghost. That we will know when the film is out. There is nothing to be sceptical about even if I do play a ghost. I wanted to be a part of a good film, which would be entertaining and fun, with great humour and dialogue. They told me that Pankajji (Tripathi), Raj (Rajkummar Rao), Apar (Aparshakti Khurana) and Abhishek (Banerjee) would be there. I was happy that I would get to work with such talented actors. Did you feel the pressure because of these performers? It had its own challenges. I put a lot of pressure on myself because everyone was so encouraging and supportive on set. I wanted to be as good as them because they are such amazing actors. I had to make sure that I put in 100 percent hard work. My director (Amar Kaushik) has been very supportive; it doesn't look like it's his first film. He knows exactly how he wanted the film to turn out. Raj and DK have written a hilarious film. 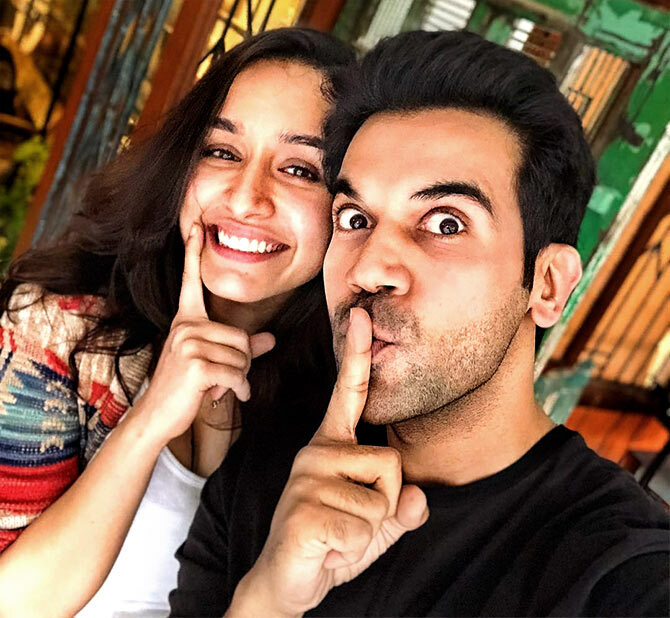 What was it like working with Rajkummar Rao? We all know what an amazing actor he is. He has done some beautiful work. I was so excited to work with him. Pankajji is brilliant. He is so funny in the film. 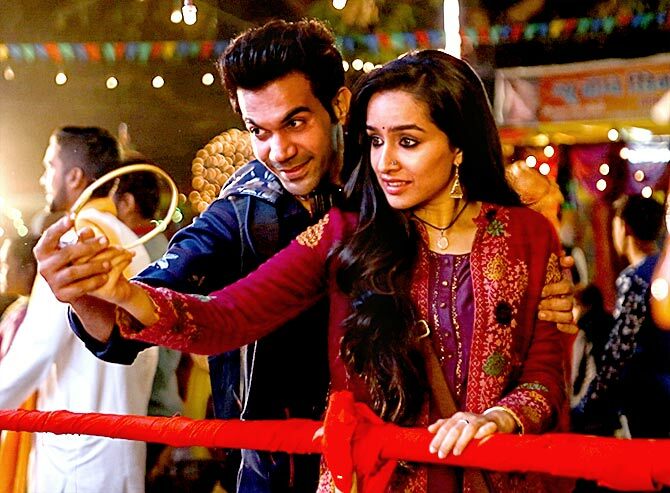 IMAGE: Rajkummar and Shraddha in Stree. The most memorable moment in the shoot? Amar Kaushik would start the day with a song. He would play it and everybody would start dancing, having fun and losing themselves in the song. It would be a great start to the day. Amar sir is so quiet and peace-loving, so the atmosphere on set would be like that. Sometimes I feel ho sakta hai, sometimes I get scared. I sleep with a small light on at night. If it's pitch dark, I get scared. I don't know about ghosts, but I get scared of thunder and lighting. Will you ever be part of a full-fledged horror film? I don't know. I get scared and then I don't get sleep. How do you deal with success and failure? I try not to get attached to success or failure because it changes constantly in the industry. I am going to try bettering myself and offer something different to the audiences each time. Does a flop like Haseena change the way you select films? No. I am doing another biopic on Saina Nehwal. I can only do what is in my hands, and that is work hard. The rest is up to the audience. I respect that because I am the audience as well. If a film doesn't interest me, I will not watch it. It (the audience) sets the bar really high in terms of content. 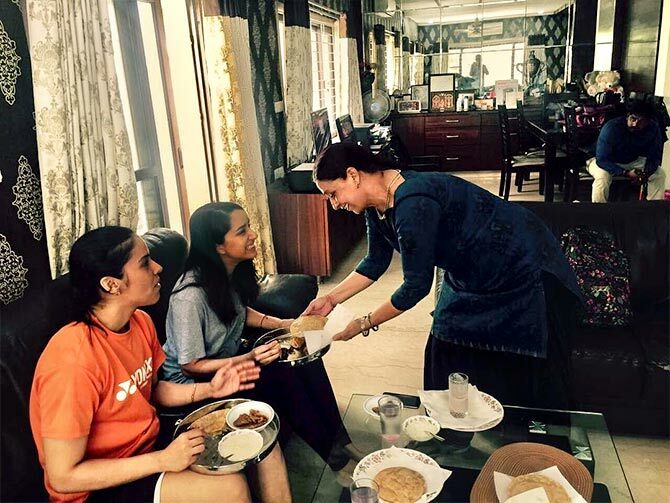 How is the prep for the Saina Nehwal biopic going on? Very well. It is really challenging. I have to be really good in a short span of time, whereas she is a champion and has been doing it for many years. I have done 36 sessions (of badminton) and have a long way to go. There is another physically intense film, Saaho. I am training for that as well. I just got saved from an injury that could have happened. It would have set me back so much. I got very lucky. It was a stunt scene. I try to do my own stunts as much as possible. I tried this stunt and my foot got stuck. My other leg was stretched in the air. If it had stretched two more inches, there could have been a tear. I was limping for a while, but thankfully, because I have been physically training for Saina and working out, my body is warm all the time. That helps when you get injured. Do you believe in box office numbers? I don't want to make that the focus of my goal. The focus is to be a part of memorable films. Your father Shakti Kapoor is on Instagram now. Yeah, he would keep on asking us, 'Insta kaisa hota hai?' and we would tell him that it's a nice way to interact and share snippets from your life with your fans. People want to be connected with you, so he was excited. He wants to post a lot about my brother and me, but we have told him to share about himself. What career advice does he give you? He tell me he is proud of me. That's very encouraging. He understands the value of getting a film. My upbringing has been with a silver spoon; my dad has given me everything. Of course, I had my own struggles to make my mark in the industry. I don't know whether it will possible. I don't take anything for granted. My dad has a deep value for the film industry because it has given him so much. Seeing the way he values it, I find it difficult to say no to a film because ek toh aap ko film offer ho rahi hai. It's a big deal that somebody wants you in their film. There are so many people, who want to be a part of this industry and have to struggle. 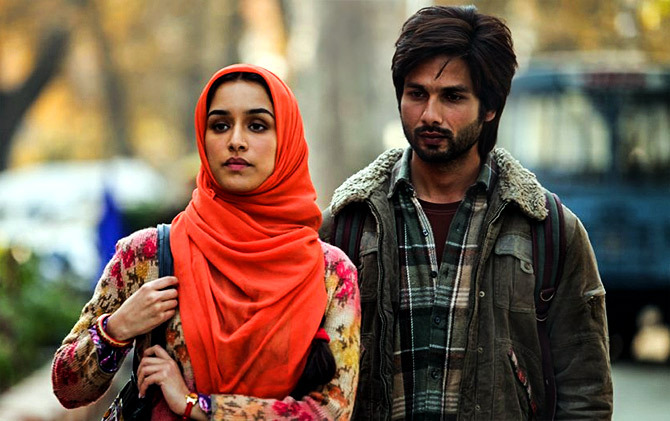 IMAGE: Shraddha and Shahid Kapoor in Haider. Have you ever gone to a director and asked for a role, like Varun did for October? He did that? That's amazing. Something like that happened with Haider. I came to know that Vishal sir (Bhardwaj) was directing his next film, so I messaged him and also asked my manager to find a way to meet him. He asked me to audition and I did. Then, I got the role. I am open to approaching to directors for roles. My dad told me that if he wanted a role, he would go approach the film-maker. 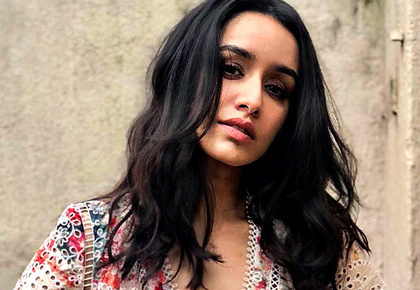 You had back-to-back successes with Aashiqui 2, Ek Villain, Haider, ABCD 2 and Baaghi, followed by a string of flops like Rock On 2, OK Jaanu, Half Girlfriend, Haseena. How difficult is it to cope with that? It's all in the audience's hands. If they don't want to watch your film, you cannot do anything. If they didn't connect with something, you have to accept it. Half Girlfriend was not a blockbuster, but it did decently well. I understand films like Rock On 2 and Haseena went completely under the radar. OK Jaanu was also appreciated, but it did not get big box office figures. Each film should be taken for what it is and should not be compared. I don't think my films have to reach a number. I do a film because of its content. I feel grateful that I am being part of films. I have this beautiful film Stree coming out, which I am very proud of. I also have Batti Gul Meter Chalu. I am nervous with every release. I am proud of all the films I have been part of.